Dee at Voices in My Mind had a post today about a box turtle that her husband brought home for her son to see. It brought back all kinds of memories for me about the turtles we used to play with when I was growing up. We lived in a rural area of Kansas City on a 13-acre plot, and there was plenty of wildlife wandering through our yard, pasture and woods at any given time. Every year, we'd catch box turtles, play with them for a while, then let them go. One year, at what must have been a parent's suggestion, we decided to name one of the turtles and paint the name on its shell with white latex house paint. That first turtle's name was Pat, and we let it go after we got tired of feeding it produce from the kitchen and watching it pee when we picked it up (just like a toad, which were also fun to play with). The next year, turtle season came along and there was Pat - except that the lettering on its shell had weathered so that the name said "Pot." Excited by our success, we started naming and marking other turtles. There was one called Zot (which was probably inspired by the cartoon "B.C.") and a small one we called Tot. I don't remember any others, but there were probably more. Occasionally a huge, washtub-sized snapping turtle would wander from one of the nearby stock ponds up to the corral or even the yard. 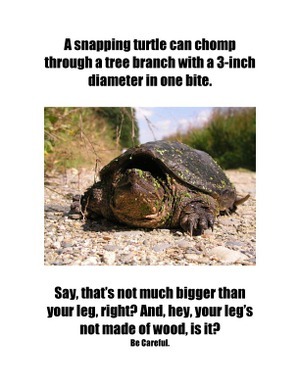 When that happened, my dad would grab it by the tail and drag it back to the woods or pond. He said that they would snap viciously the whole time, cleanly severing saplings as big around as his thumb. Those stories made me equally scared and fascinated. What wild creatures did you encounter as a child? Do you still see them around? Last weekend I was shopping with my sister, niece and aunt in Lawrence, Kansas. There's a shop there called Brits that specializes in imported British stuff - mainly food, but also DVDs and a few gift items. While we were there, I purchased a jar of blackcurrant preserves because NOBODY in the U.S. makes them. I also got a bag of miniature Violet Crumble bars (which are actually Australian), and split them with my sister. Damn, those are delicious! I didn't pick up my other British fave, Twinings Decaffeinated Green Tea, because I can get it cheaper at World Market. A trip to World Market also gives me the opportunity to buy Kasugai muscat grape-flavored gummy candy from Japan, and Pepparkakor Swedish Gingersnaps, which come in a huge, beautiful tin. Here's my reader question for the day: what's your favorite imported food treat? If you're outside of the U.S., what's a food item where you live that you love so much, you'd recommend I try to get some? I think that autumn might be my favorite season. I love the cooler air and the way the sun takes on a golden cast as it shines through the trees once they've turned colors. I don't appreciate that fall is really short and quickly gives way to winter, but you can't have everything. One reason I like the cooler temperatures is that most of my cooking specialties are best suited for cold weather. I can hardly wait to make my first pot of chicken and dumplings for the season. Tonight we're having two crockpot dishes. In my smaller crockpot I've put two thick pork chops and a brown sugar-and-butter-stuffed apple. The larger crockpot holds a chopped head of cabbage and a ham bone. All I'll need to do when I get home is fix some potatoes. I think I'll roast them with some olive oil, salt and pepper. Oh, and I'd probably better make another vegetable for the hubby. He's already balking at the cabbage, to which I say, "Fine - more for me!" Any other fall fans out there? What do you like best about autumn? I can't resist a challenge from BlogHer, so here's a variation on green bean casserole that steers away from all the cliches. You won't find cream of mushroom soup, canned green beans or fried onions here. This recipe calls for fresh, steamed green beans in a creamy bechamel sauce, topped with slivered almonds that end up being toasted during the baking process. It's not quite as quick as the traditional recipe, but it's arguably more delicious. Snap off the ends and pull the strings from the green beans, then steam until tender-crisp and set aside. To make sauce, melt butter in a large saucepan over medium heat. Once melted, stir in the flour, mixing until smooth. Continue stirring for about 7 minutes until the mixture becomes a light golden color. Increase heat to medium-high and whisk in milk slowly until thickened. Bring to a gentle simmer, then reduce heat to medium-low and continue simmering until the flour has softened and loses any grittiness, 10 to 20 minutes, then season with salt and nutmeg. Combine sauce and beans and place in a greased casserole dish. Top with slivered almonds and bake at 350 degrees Fahrenheit for 30 minutes. Speaking of miscellanea, do you read Miss Cellania? She must do more web surfing than anyone else on the planet. Every day she has at least one long post on a particular subject, with all kinds of jokes, cartoons, links and stories. She also contributes to a bunch of other sites. What a fun job that must be! It turns out that my cat, Xena, likes to play fetch. She has a shiny, crinkly ball that she'll chase and bring back over and over if we throw it. If I'm distracted during the game, she'll jump onto the couch, roll onto her back and push the ball in my direction as a reminder. The game ends when she gets tired and stops bringing the ball back. I'm willing to play as long as she is because she could use the exercise. This week I've been taking steps to get my budget under control. I've discontinued my vocal lessons for the time being, and talked Time Warner into dropping my phone/cable/Internet bill by $50 a month. I had to sacrifice HBO in the process, but we're not watching any HBO shows now anyway. Just those two cutbacks alone will save me almost $3,000 a year (although I'd really like to resume the vocal coaching if and when I can afford it - probably when I'm getting enough band gigs to cover the expense). Ooh, that reminds me that I need to discontinue my Gevalia coffee subscription. Particularly since I haven't had a cup of coffee in months. That's enough rambling for today, don't you think? Have a great weekend. Hey, how about another recipe? This is an old family recipe that I know my great-grandmother used to make; it might be older than that. My grandmother made it a lot because it was my grandfather's favorite dessert. It's easier to make than you might think. Beat the 4 egg whites until they form soft peaks, add 1/2 cup sugar and continue beating until meringue is shiny and forms stiff peaks. Rub both lemons with a fine grater until most of the yellow rind has been removed. Juice lemons and remove any seeds. Combine egg yolks, 2/3 cup sugar, lemon juice and rind and water and heat to a simmer. Mix corn starch with a small amount of water and add to filling mixture. Cook until thickened to the consistency of gravy. Remove from heat and fold in about half the egg whites, leaving enough for meringue. Place filling in pie crust and top with remaining egg whites, making sure to seal the edges to the crust to prevent weeping. Bake at 350 until the tips of the meringue are browned (about 15 minutes or so). *I like the Jiffy pie crust mix because it's cheap and foolproof. Note: The recipe card I have for this skimps on a lot of the preparation details, so I've filled in the blanks as best I can. If something doesn't make sense, let me know and I'll correct it. Update 9/28/07: Goofy Girl's questions have led me to update the directions. Hope they're a little clearer now! This is what my office looks like when it's relatively clean. Right now it's much messier than this and my goal for the coming weekend is to get it cleaned up at least back to this standard. You can tell this is an old photo by the coffee cups. Now my desk is littered with empty water glasses. I'm hoping to get rid of the Big Tubs O' Stuff like the one shown on the left. There are actually three of them, all of which were hastily filled with papers, software, electronics, etc. when we began our studio and office remodeling project late last winter. The fact that I haven't needed anything from any of the tubs since then indicates that most of their contents can be thrown out. My office is separated from our recording studio by a sliding glass door and I know my husband is embarrassed by the easily visible chaos of my office when he has clients over. 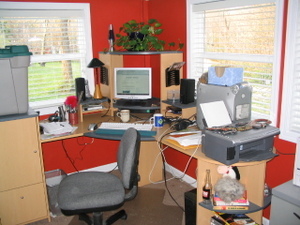 Of course, the studio isn't exactly a paragon of cleanliness either, but I have to admit that my office is worse. Wish me luck getting it back to some semblance of tidiness. Today is my little sister's birthday. I was three when she was born and did not appreciate ceding my position in the household to the interloper. Somewhere I have a Super-8 movie that shows me holding her when she came home from the hospital. One of my hands is balled into a fist and I'm aiming it threateningly at the baby's face. As we got older, the fighting intensified. I still have some scattered scars on one arm from her fingernails. Eventually we developed an extremely elaborate system of blackmail that kept the tattling and fighting to a bare minimum, although the occasional battle still broke out over unauthorized borrowing of clothes well into our high school years. Then a funny thing happened when we grew up and moved out on our own: we became good friends. We discovered that we had more in common than we thought, and after a while we figured out that we travel well together, so we started taking fun trips. One of my favorites was the vacation to Myrtle Beach, South Carolina where we drank rum drinks, visited every single Ripley's Believe It or Not attraction in town (there were at least three), went to an alligator park and the House of Blues, and basically had a good old touristy time - none of which was planned in advance. My sister constantly impresses me with the things she manages to accomplish. She's a shrewd businesswoman, a great mom, a creative thinker, a loyal friend, and a lot of fun to be around. I have very little to report about the past weekend. I hung out with Cagey and Pharmgirl, baked a half recipe of Banana Bread (we only had one overripe banana), watched the season finales of "Psych" and "The 4400," and clipped all of the cats' claws. I did two loads of laundry, washed all the pots and pans and ran the dishwasher. Probably the most involved thing I did all weekend was re-dye the blue in my hair. I made such a mess that I ended up having to scrub down both sinks and the shower afterward. Blue turns out to be a difficult color to maintain, so if you decide to go the not-found-in-nature hair color route, be warned. I have another busy week planned, but tonight is my one free evening. Do you have any suggestions for what I should make for dinner? A rapper that my husband has been recording lately is planning on bringing his mom with him to a session later this week. I guess that means I should use some of my evening to figure out what's ailing the Roomba so it can tidy up the studio a bit. And that's all I've got. Have a nice Monday. The accumulated irritants of the week have been bringing me down, so in celebration of Friday, I'm going to mention them all here and sweep them out of my consciousness for the weekend. Comment Spammers. One of my posts has been getting a rash of comment spam in the last week or so. I finally had to go in and close its comments, which I've rarely had to do before. Grrr. Regular Spammers. My job involves monitoring an e-mail account that's accessed through an old SquirrelMail e-mail client. It has NO spam filtering whatsoever, so I get to watch batches of related subject lines come and go as I scroll through the junk trying to find the few legitimate e-mails that may have crept through. For the last few weeks, the most noticeable subject line trend has been "My boyfriend's [x] is too big for my [y]. The best part is [x], which encompasses a full thesaurus' worth of terms, many of which do not mean precisely what was intended. I think my favorite [x] of the week was "phallus." Hee! 'Cause everybody talks like that, you know. My Car. I'm actually feeling favorably inclined toward my car this week in one way: ever since the weather got cool enough that I don't need my air conditioner, my gas mileage has improved. The bad thing is that it has a burned out headlight, which got me pulled over on the way home from band practice Wednesday night (at midnight, I might add). I didn't get a ticket and the officer actually said, "I appreciate your wearing your seatbelt," which I thought was some nice positive reinforcement, but the idea that the next guy might ticket me $80 did not make me at all happy. I have an appointment at the crack of dawn this morning to get a new headlight and also find out why the "maint. req." light is on. [Update] It turned out someone forgot to reset the light after my last oil change. I was in and out in less than 45 minutes and my headlight replacement cost $12. My Brain. I have been incredibly forgetful this week. For example, I left my cell phone at home two days in a row. On the second day, I made a special trip home specifically to get my phone before I went to some after-work activities. I still walked off without it. Okay, I'm finished griping now and I'm ready to start the weekend with a clean slate. If you have something that's been bugging you, feel free to write about it in the comments and leave it behind as you start your weekend.